With 9.5% unemployment and his quadrupling of the national deficit in his first 6 months in office what did you expect? Barack Obama has dropped 35 points in his first 200 days in office. Obama’s approval index number reached a new low today. The Rasmussen Reports daily Presidential Tracking Poll for Wednesday shows that 32% of the nation’s voters now Strongly Approve of the way that Barack Obama is performing his role as President. Thirty-seven percent (37%) Strongly Disapprove giving Obama a Presidential Approval Index rating of –5. 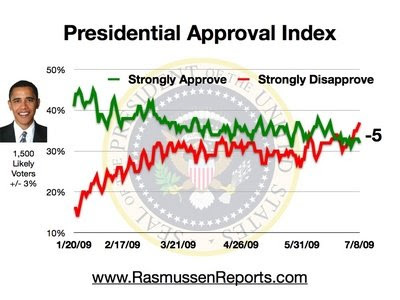 The number who strongly disapprove inched up another point to the highest level measured to date and the overall Approval Index is at the lowest level yet for Obama (see trends). Why Unemployment Could Hit 14%. The Labor Market Is Worse Than You Think. U.S. Workers Hired at Slowest Rate in 9 Years. Consumer Loan Delinquencies Rise to Record Levels.